Time to get beady… I’m so happy, I’m buried in beads! After my epiphany the other day I was able to get in and start some beading this afternoon. Typical really, when I have no inclination to bead, I have plenty of time, and when I really want to get beady… I’m so damn busy I have to fight myself for time. I thought about it more as I played today. Asymmetrical doesn’t have to mean uneven like my necklace in the last post. But it can be different textures, opposing colours or as simple as having the focal point on the side (making sure it is weighted properly otherwise the effect is lost as it slides round your neck). 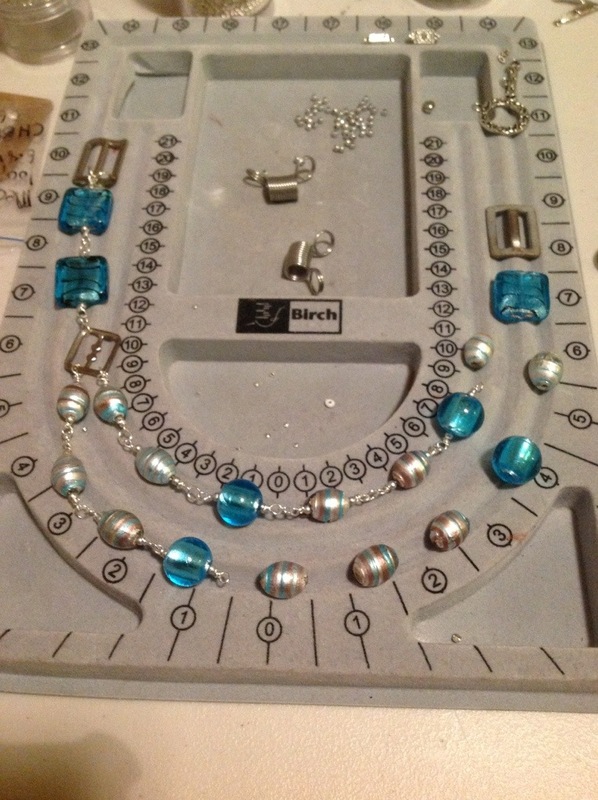 A well as asymmetrical pieces I am going to do more of what I call ‘tie backs’ a necklace with a small beaded section and then ribbon, leather or material used to tie the necklace to your length. Looking through some magazines I found lots of ideas for these by simply changing the components slightly. Now I have to get and buy more ribbons and fibres… Wonder if mum has any bits she doesn’t want..?? 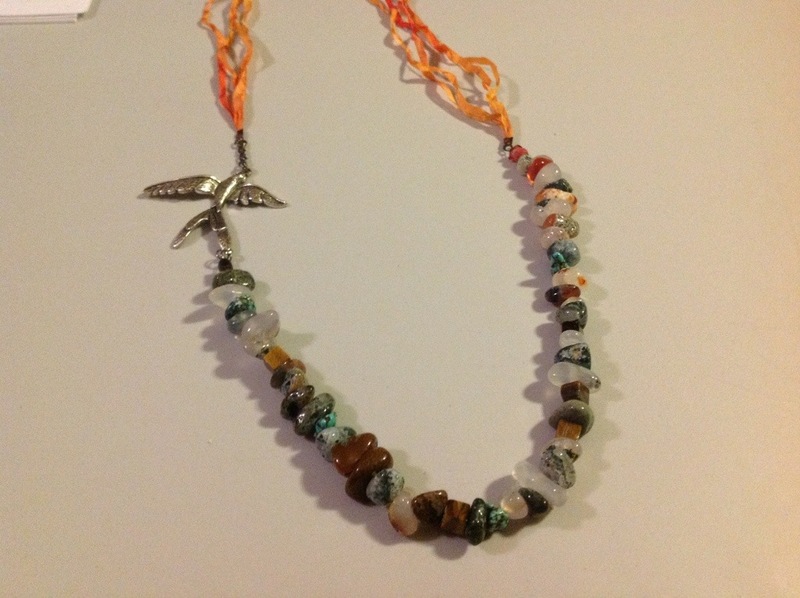 Moss Agate with red and orange ribbon and silver bird bead. 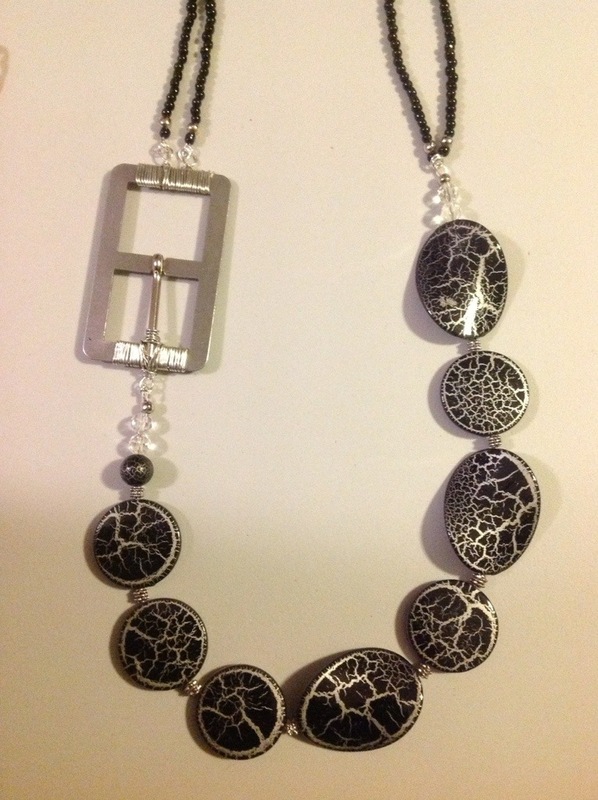 Faux pearls linked with silver beads and belt buckles. Still not sure how to finish this one. 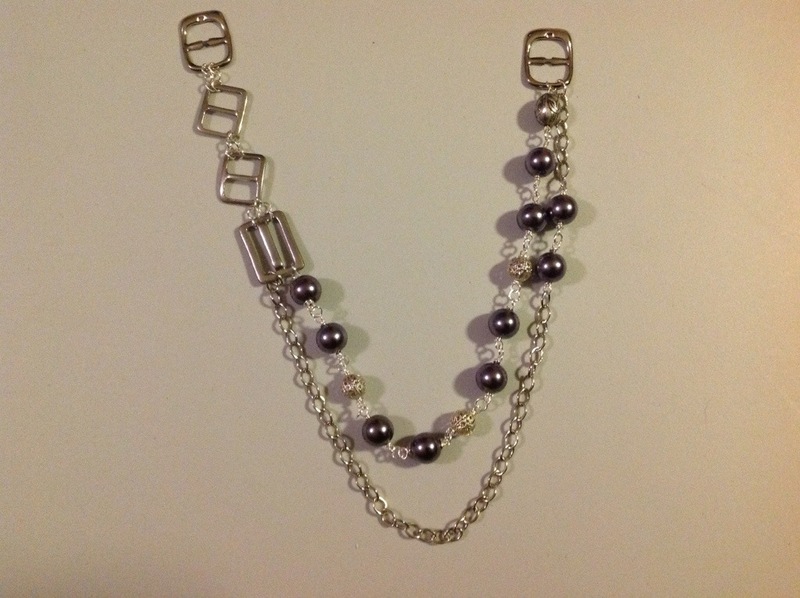 More chain, small pearls, other beads or white/silver ribbon…. 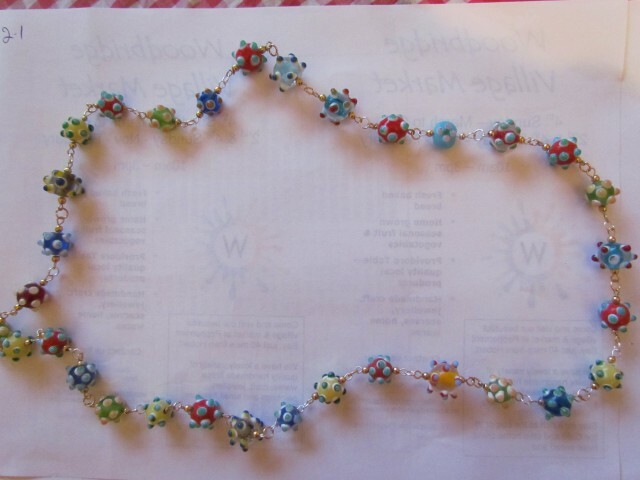 A super chunky one with wire wrapped buckle, large beads and two strands of seed beads to finish. 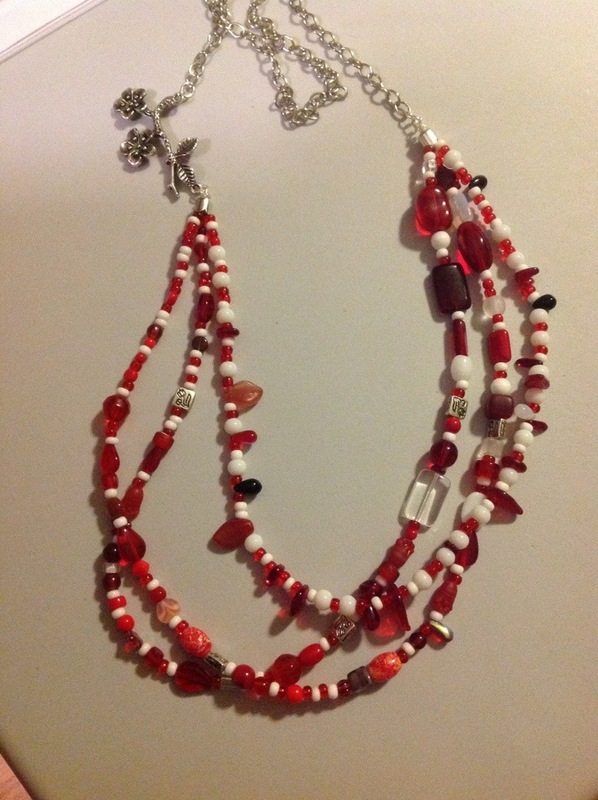 A triple strand of (peppermint/candy cane) red and white bead soup with a flower pendant and chain to finish. Not sure if the chain is right, but white seed beads were definitely wrong and I didn’t want too many beads. And the one I’m working on, left at this point while I picked up my son from work, to be completed tomorrow sometime. I also have a little repair job to do for a lovely lady who is a repeat customer in repair jobs. My website will be reflecting the change once I have my pictures done. This entry was posted in Beading, Craft Shows & Markets, websites and tagged Asymmetrical, birds, chain, focal beads, lowers, necklaces, semi precious, symmetry. Bookmark the permalink. Thanks, I think I just replied to this on the other blog… The notification popped up as I was replying to your other comment. Oops. It’ll be interesting how many people will be there. I rang the manager to have a chat about some ideas, and he hasn’t rung me back. More on this later. I hope it’s not a case of new phone number.